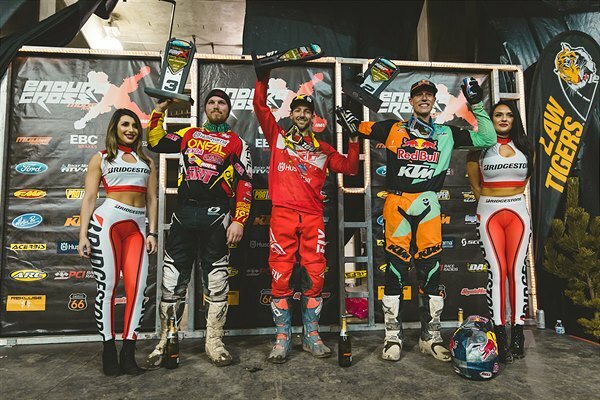 The Rockstar Energy Husqvarna Factory Racing Off Road team had a winning night at the penultimate round of a very exciting EnduroCross series, held at the Angel Of The Winds Arena in Everett, Wash. on Saturday. After a dramatic victory at the previous round in Denver, Colton Haaker extended his points lead in Everett by earning another hard-fought win. Haaker started the night with a win in his heat race, then finished second in the bracket races, just missing out on the all-important extra championship point. He lined up for the Super EnduroCross Main Event looking to clock in yet another win and went to battle as soon as the gate dropped. He rode hard and pushed through the entire Main Event then made an exciting pass for the lead with two laps remaining to take the win. The victory further extends his points lead as the series heads to the final championship round.